The last few months in the U.S. have shown us the infinite power of women to raise and discuss issues intelligently and non-violently, such as the political campaign of a woman for President and the recent Women’s Marches. It seemed utterly logical to showcase dramatic works about women and their unique perspective on love and life. 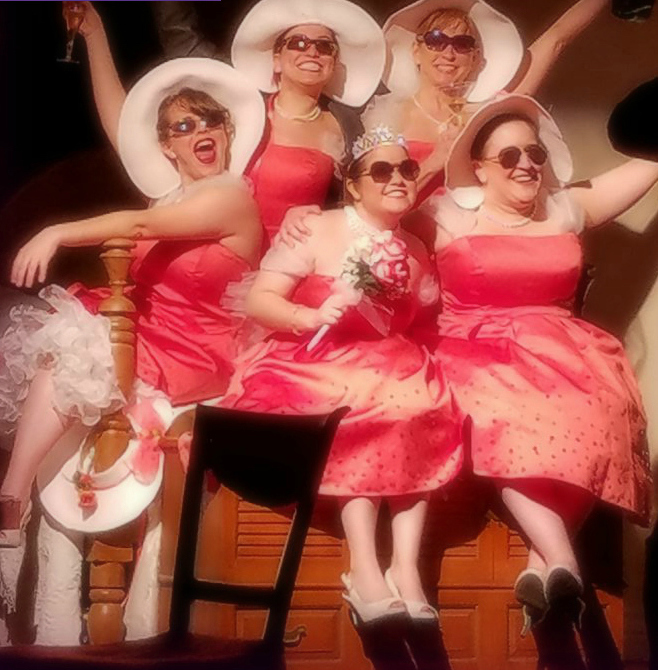 The Suffield Players recently staged production of Alan Ball’s (of “American Beauty” and “Six Feet Under” fame) comedy “Five Women Wearing the Same Dress” was a fine case in point. Directed in a relaxed, natural style by Kelly Seip, the show featured a quintet of VERY different women: Naïve Frances (Amy Lambert), high-strung Meredith (Tina Sparkle), blowsy Georgeanne (Trish Urso), cerebral Mindy (Jen Rawlings), and sensible Trish (Karen Balaska). These women, reluctant bridesmaids at a swanky wedding in Knoxville, Tennessee, hideout and pour their hearts out in Meredith’s upstairs bedroom. Each one tells her story in humorous and touching ways. Act I, with all of its exposition, paled when compared to the much livelier Act II. Among the fine cast, Urso, Rawlings, and Balaska stood out. Urso’s bellowing Georgeanne swilled her champagne and bragged of her sexual conquests with comic aplomb. Rawling’s lesbian Mindy downed platefuls of appetizers and offered well-played wittiness. Balaska’s maternal Trish stood her ground against bible-thumping Frances and the advances of the play’s lone male character (nicely played by Shaun O’Keefe) with bawdy verbal jousts like a modern Mae West. Although it resembled “Steel Magnolias,” Ball’s play was a refreshingly more adult, R-rated vision of the camaraderie among a group of diverse women.